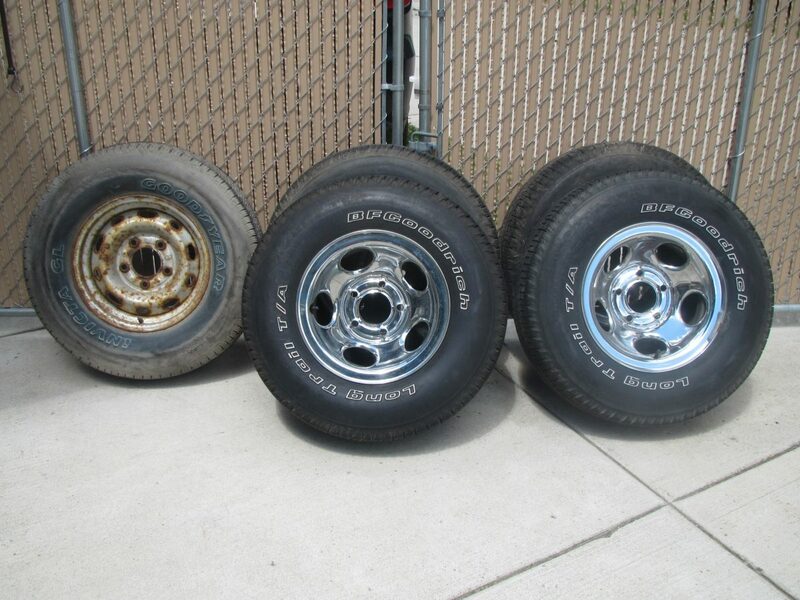 Set of 4 BF Goodrich Long Trail T/A All season radials, mounted on vintage Dodge chrome spoke steel wheels, no added charge for the wheels. Without hub caps. these tires were purchased in pairs, 2 seasons apart. The newest ones have about 1000 miles on them and the older, about 8000. All are in excellent condition. Also included is an older mounted tire that has served as a spare. Although in excellent condition, it is old, but good enough for a slow ride to a repair station to fix one of the set. Wheel size is 15″ x 7″ 5 x 5.5 bolt pattern.